The Irish language makes the front page of two of Northern Ireland's daily papers. Official status for the language through an Irish Language Act is understood to be the major sticking point between the parties in talks aimed at restoring power sharing. 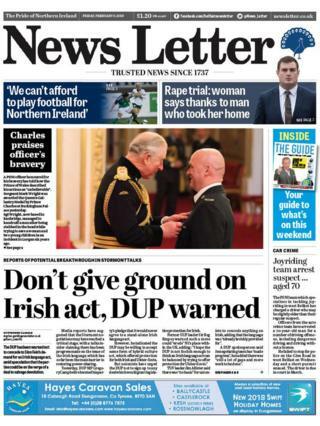 "Don't give ground on Irish act, DUP warned," is the front page headline in the News Letter. It comes as some reports suggest that progress has been made on the issue. The DUP's Gregory Campbell has reiterated his party's position against a 'stand-alone' act however. He said that the party may be willing to accept a hybrid culture act which includes Ulster-Scots, the News Letter reports. The paper's editorial says that Sinn Féin is "trying to use the Irish language as yet another wedge in a deeply divided society". The Belfast Telegraph however is reporting that hopes of a Stormont deal are "high". "The DUP and Sinn Féin are continuing to hammer out the details of the proposed agreement that would see the return of the Assembly and the Executive," the paper reports. A more local dispute concerning the Irish language makes the front page of the Irish News. "An Irish language group has criticised a council chief executive for claiming they failed to turn up for a meeting," the paper reports. Conradh na Gaeilge is to make a complaint after Anne Donaghy, the chief executive of Mid and East Antrim council, made the claim. Interestingly, the Irish News gives little coverage to the Stormont talks. It does, however, carry comments from Sinn Féin president Gerry Adams conceding that some progress has been made but warning that "there are still a lot of gaps and more work to be done". Image caption Bernadette McAliskey called Sinn Féin analysis of the origins of the Northern Ireland Civil Rights Movement as "delusional silliness"
The Irish News lead features former MP Bernadette McAliskey "rubbishing" a recent article from Sinn Féin chairperson Declan Kearney in which he wrote that many people who were involved in forming the Northern Ireland Civil Rights Movement later became prominent in Sinn Féin and the IRA. Staying with politics, and as Gerry Adams prepares to hand over the presidency of Sinn Féin to Mary Lou McDonald, his legacy is the subject of analysis in the Belfast Telegraph. The paper's political editor Suzanne Breen writes that Adams' genius has been "in selling defeat as victory". And finally, in the future will it take and hour and a half to get from Newry to Dundalk? It is unlikely but the Daily Mirror reports that the EU plans to do away with summer time clock changes could see that the Republic of Ireland and Northern Ireland could end up in different time zones. If passed by the European Commission it could that it would be 11:00 BST in one part of Pettigo and 10:00 European time in the other.